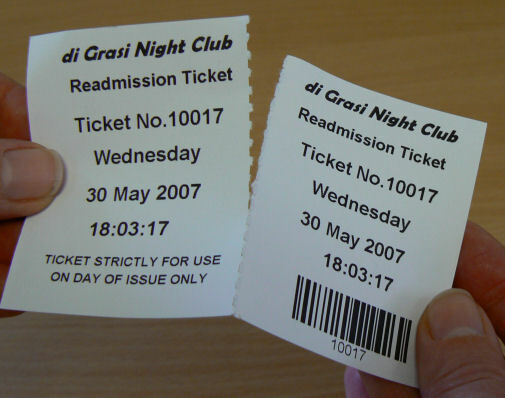 Scroll further down this page to see further details and pictures of examples of 1 and 2 Part Perforated Tickets! 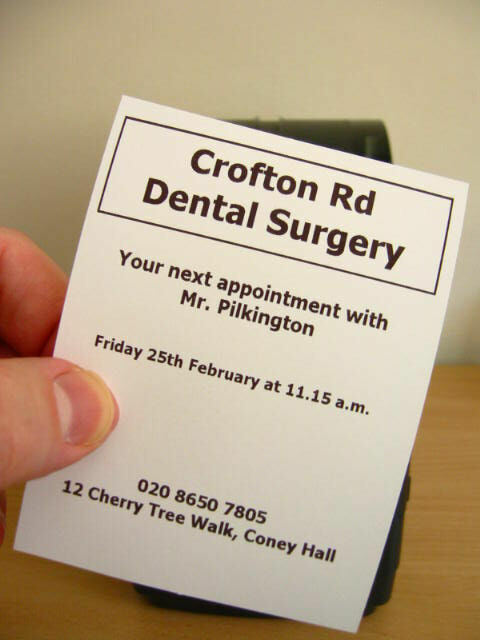 We can supply Direct Thermal Tickets, in a wide variety of sizes for Appointment Cards, Coupons and Vouchers as Fan Fold Tickets with perforations between the tickets and optional Perforated Tear Off Stubs in a variety of sizes or also can be supplied on Continuous Rolls of Ticket Paper for a wide variety of uses. 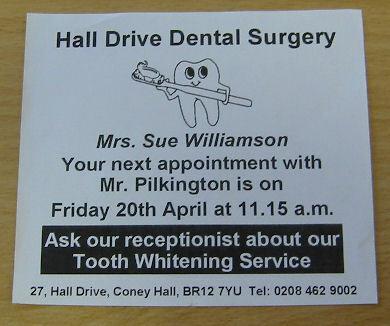 Tickets can be supplied blank plain white or colour washed or printed with your own design on the ticket face or reverse side of tickets. 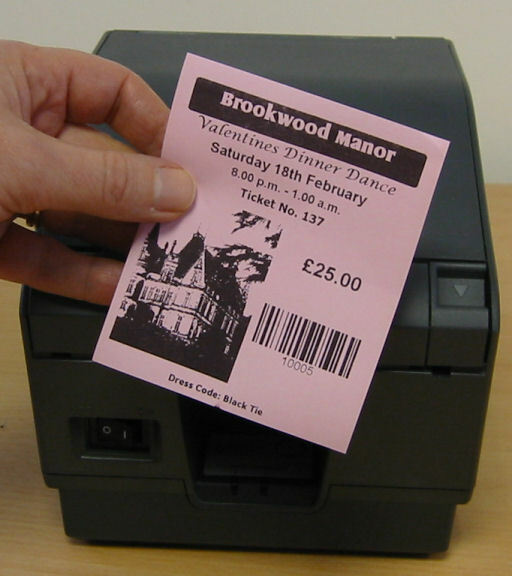 We can offer a Ticket Printing System with a Direct Thermal Ticket Printer, Software and Direct Thermal Tickets to create and print your own tickets on demand with sequential numbers, barcodes, date and time stamping and other functions as required. 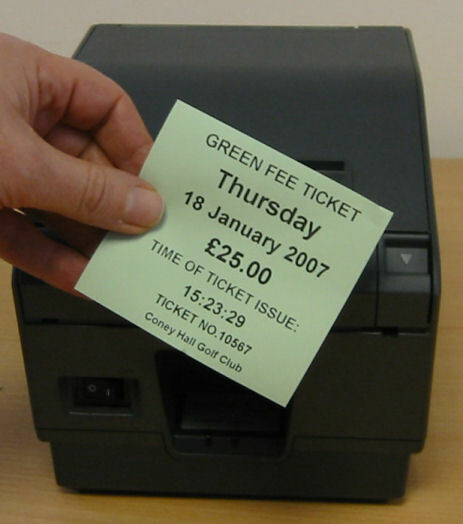 See Software for creating your own Tickets with Event Description, Sequential Ticket Numbers and Barcodes, Date, Time Stamp and many other features We can supply tickets and a ticket printer or tickets to suit your own printer especially Boca, Citizen, Datamax, Datamax-O'Neil, Intermec, Kroy, Sato, Star Micronics, Toshiba TEC, TSC, Wasp, Zebra printers and also other makes of ticket printers. 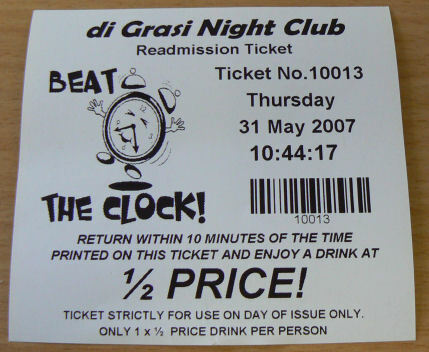 A wide range of Direct Thermal Tickets can be created for an extensive range of applications such as Admission Tickets, Airline Tickets, Auction Tickets, Audience Tickets, Amusement Park Tickets, Baggage Tickets, Betting Slips, Boarding Cards, Boarding Passes, Boat Tickets, Camp Site Tickets, Caravan Site Tickets, Car Park Tickets, Cinema Tickets, Club Tickets, Cloakroom Tickets, Coach Tickets, Concert Tickets, Conference Badges for Guests, Coupons, Ticket Printers printing to Tickets Rolls, Delivery Notes, Dental Appointment cards, Dinner Dance Tickets, Disco Tickets, Electrical Repair Tickets, Doctor's Appointment Cards, Entrance Tickets, Event Tickets, Exhibition Tickets, Ferry Tickets, Gig Tickets, Green Fee Tickets, Hologram Tickets, Job Tickets, Kiosk Tickets, Luggage Tickets, Match Tickets, Museum Tickets, Night Club Tickets, Orchestra Tickets, Passenger Tickets, Raffle Tickets, Repair Tickets, Rugby Club Tickets, Sale Tickets, Swing Tags, Swing Tickets, Seat Tickets, Shelf Edge Tickets, Shoe Repair Tickets, Rugby Club Tickets, Show Tickets, Sports Events, Stadium Tickets, Stately Homes, Surgery Appointment Cards, Theatre Tickets, Theme Park Tickets, Transport Tickets, Bus Tickets, Coach Tickets, Railway Tickets, Train Tickets, Tram Tickets, Visitor Tickets, Tickets with Counterfoil, Tickets with Photo ID, Tickets with Perforations, Tickets with 2 Part Perforated Tear Off Stubs, Vouchers, Travel Tickets, Weighbridge Tickets. 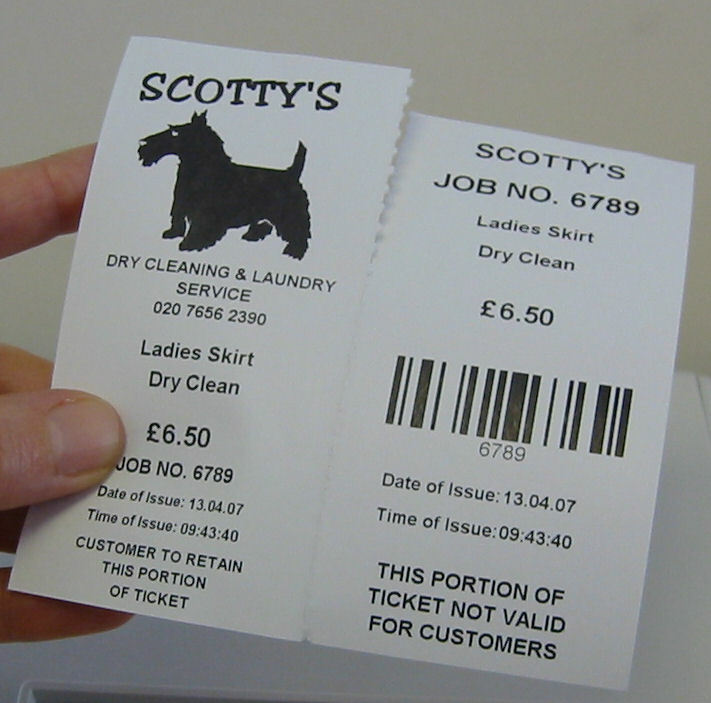 See Anti Fraud Direct Thermal Security Paper. 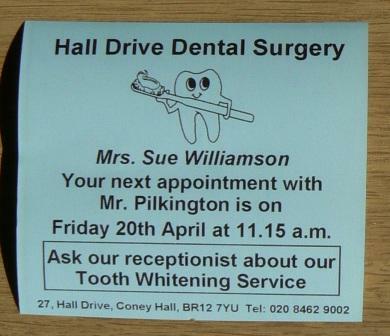 Pre Printed Water Mark disappears when photo copied! 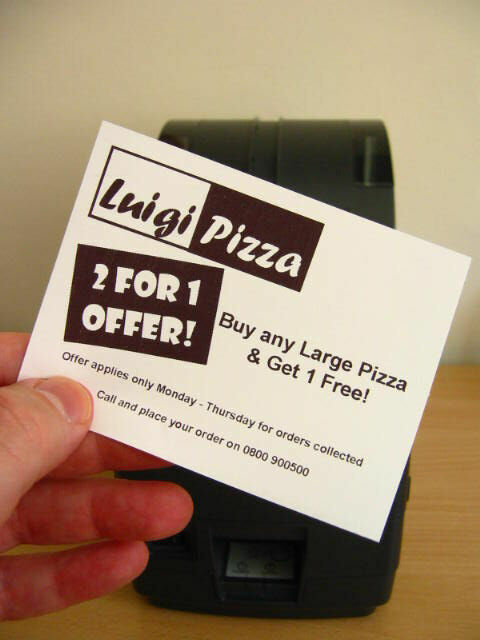 Ideal for Receipts and Tickets on Rolls of Direct Thermal Paper! 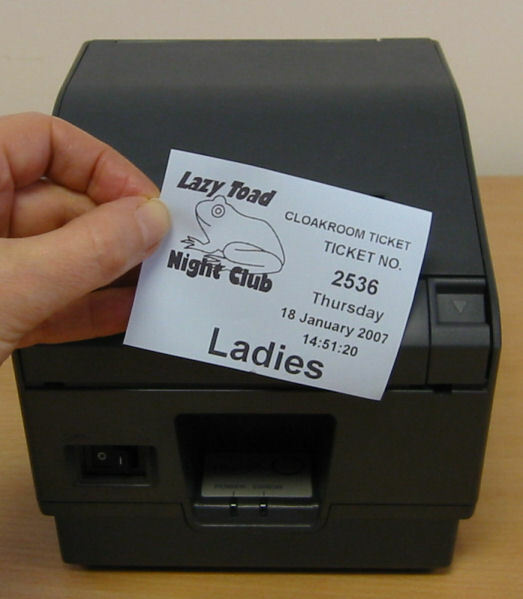 With Star's Windows Raster Driver the Star TSP1000 Ticket Printer can produce excellent looking tickets printing True Type Fonts and Graphics! 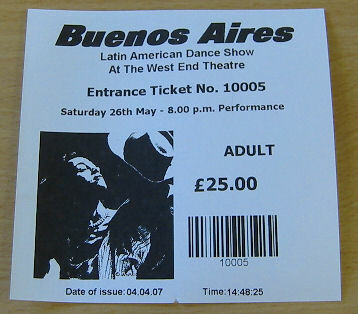 Examples of tickets shown below are printed on the Star TSP1000 on 80mm wide rolls. 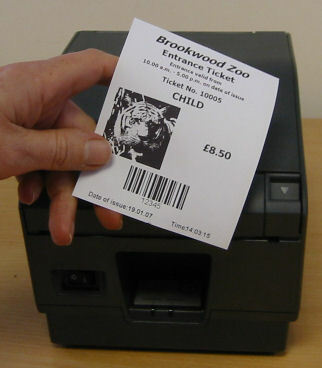 However the Star TSP1000 can be set to print in portrait or landscape format and can be set to cut the tickets in a variety of lengths. 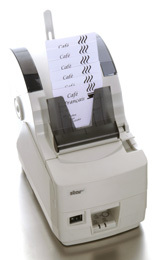 Star TSP700II Ticket Printer with Guillotine & Tear Bar for printing 80mm Wide Tickets, Appointment Cards & Vouchers. 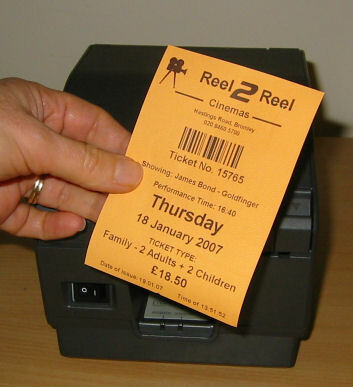 When printing on ticket rolls of 80mm width tickets can be printed in a variety of lengths with printing available in Portrait or Landscape formats. 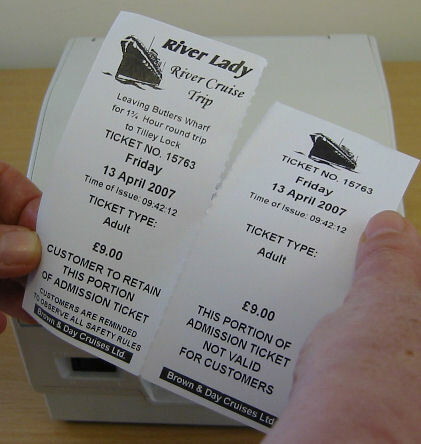 Tickets available on rolls as 1 part or 2 part tickets with centre perforation. Colours available White, Blue, Green, Orange, Pink, Yellow. 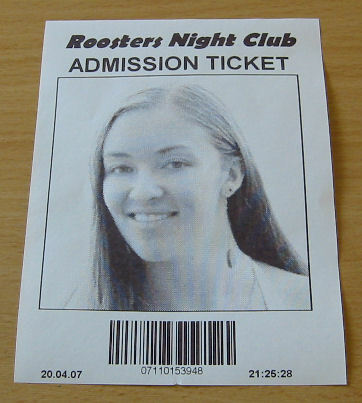 With Star's Windows Raster Driver The Star TSP700II Ticket Printer can produce excellent looking tickets printing True Type Fonts and Graphics! 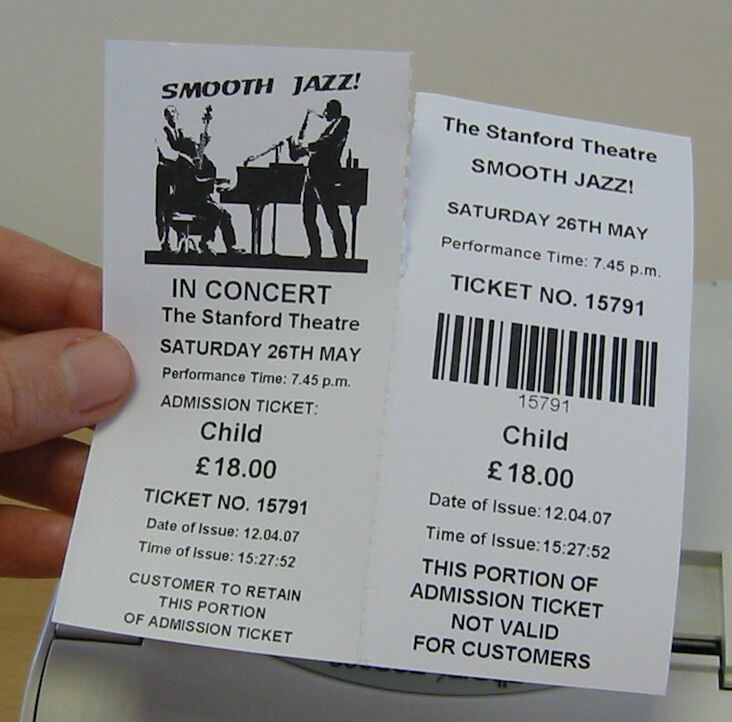 Examples of tickets shown below are printed on the Star TSP700II on 80mm wide rolls. However the Star TSP700II can be set to print in portrait or landscape format and can be set to cut the tickets in a variety of lengths. 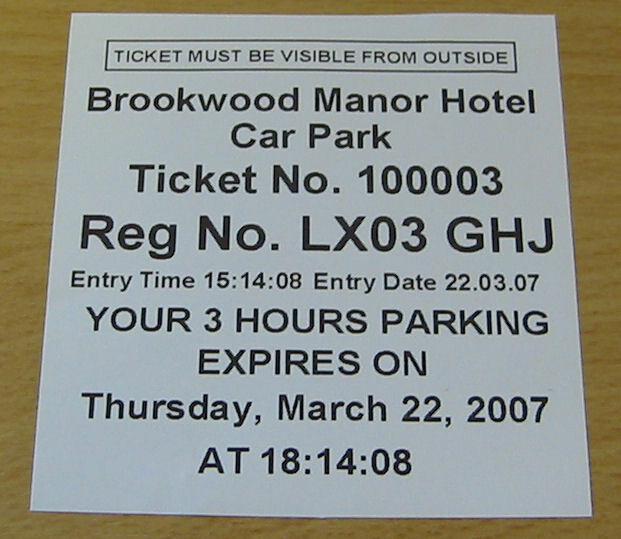 2 Part Direct Thermal Ticket 80mm wide with a centre perforation. 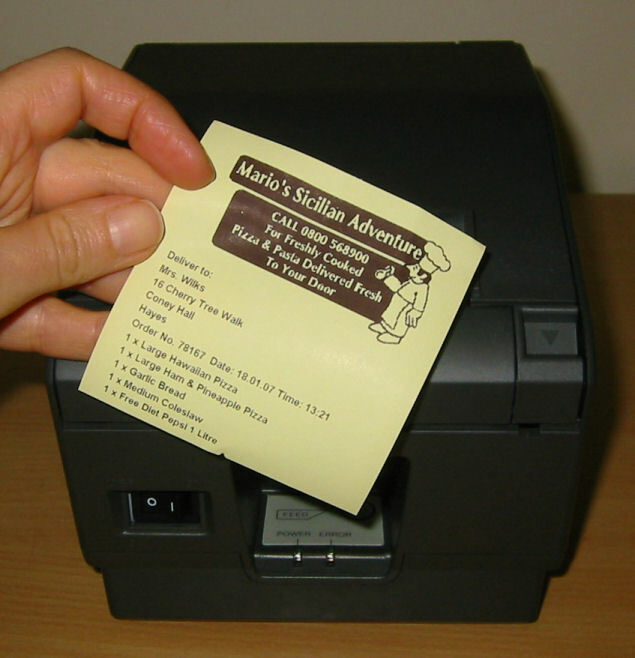 Star TSP800 Ticket Printer with Guillotine for Full Cut and Partial Cut & Tear Bar for printing 111mm Wide Tickets, Appointment Cards & Vouchers. 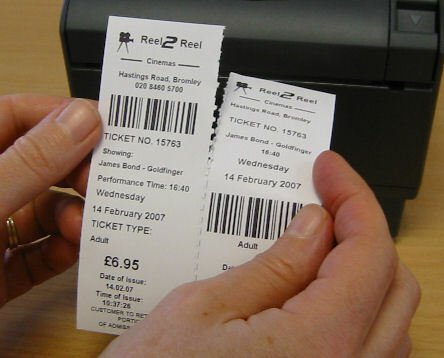 When printing on ticket rolls of 111mm width tickets can be printed in a variety of lengths with printing available in Portrait or Landscape formats. 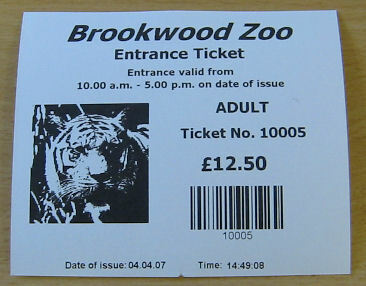 Tickets available on rolls as 1 part or 2 part tickets with centre perforation. Colours available White, Blue, Green, Orange, Pink, Yellow. 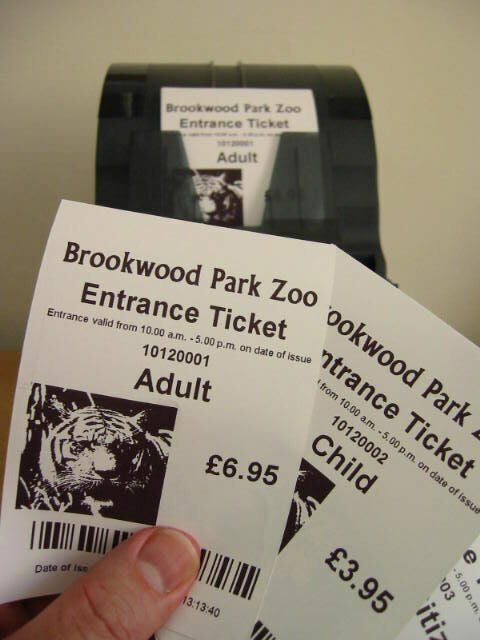 With Star's Windows Raster Driver The Star TSP800II Ticket Printer can produce excellent looking tickets printing True Type Fonts and Graphics! 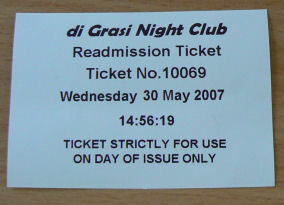 Examples of tickets shown below are printed on the Star TSP800II on 111mm wide rolls. 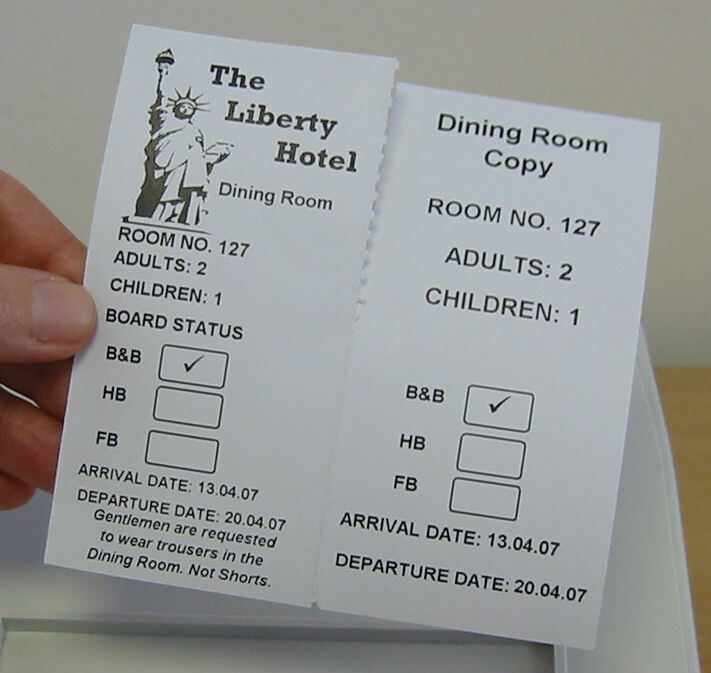 However the Star TSP800II can be set to print in portrait or landscape format and can be set to cut the tickets in a variety of lengths. 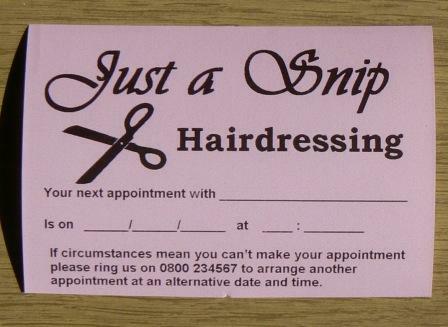 2 Part Direct Thermal Ticket 111mm wide with a centre perforation. Customer Pictures on Fan Fold Tickets!